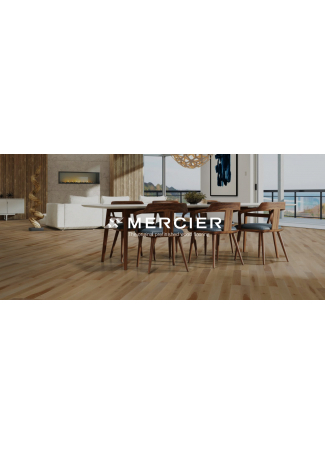 More than 35 years ago, Mercier Flooring understood that wood is a natural material that requires a unique approach. Since then, every minute of every hour in every day, the company has devoted themselves to offering superior products, while always respecting the environment. 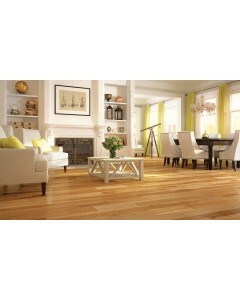 Their hardwood floors are eco-intelligent and safe. Because the company thinks about your health, their Mercier Generation Greenguard Certified finish is made of 100% pure soybean oil, the healthiest choice for you and your family. Concerned about the environment and the forests, together with our 230 employees, they are committed to reducing the environmental impact. Mercier has the lowest losses in the industry with 2 to 3% versus 5% for our competitors. Natural Hickory 3/4" x 2¼"
Hickory (Carrya spp.) is a textured wood with visible growth rings. 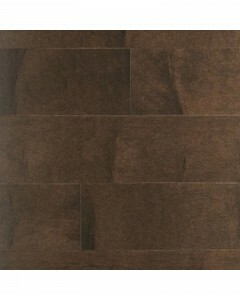 Its color characterized by a wide range of tones ranges from golden beige to deep brown. This essence also contains nodes that accentuate its naturalness. This wood has a hardness of 1820 in the Janka test. Available Dimensions: 2¼", 3¼", 4¼"
Natural American Cherry 3/4" x 2¼"
American Cherry wood (Prunus serotina) is straight grained with a fine, uniform texture. Its contrasting colour ranges from creamy white to pinkish brown to a deep red. The slats have marked colour contrasts. The colour change is very pronounced, becoming a rich reddish brown. This wood has a Janka hardness rating of 950. 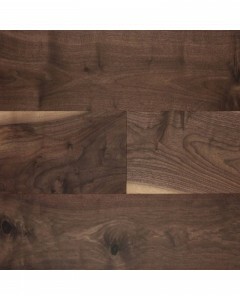 Available Dimensions: 2¼", 3¼"
Element American Walnut 3/4" x 3¼"
American Walnut (Juglans) offers rich and varied contrasting tones. Its colour ranges from a beige that’s practically white in the sapwood to a light brown, to chocolate brown in the heartwood. Walnut changes colour moderately over time, becoming a lighter, golden more uniform brown. This wood has a Janka hardness rating of 1010. Available Dimensions: 3¼"
Chocolate Brown Hard Maple 3/4" x 2¼"
Maple (Acer saccharum) is a fine-grained wood with a uniform texture. Its growth rings are narrow and faintly contrasted. Its color varies from a beige that’s almost white in the sapwood to a more full-bodied brown, making it the lightest hardwood species. Its color changes moderately over time, becoming more golden hued. Has a Janka hardness rating of 1450. 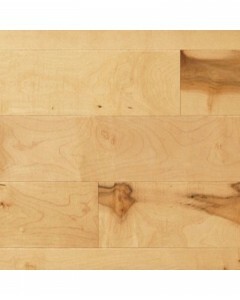 Available Dimensions: 2¼", 3¼", 4¼"
Castello Hickory 3/4" x 4¼"
Hickory (Carrya spp.) is a textured wood with visible growth rings. Its colour varies widely in tone, going from golden brown to full-bodied brown. This species also has pronounced knots that accentuate its natural character. It has a Janka hardness rating of 1820. Available Dimensions: 4¼"
Americans Red Oak Mercier Heritage Series : 3¼ " 5" x 1/2"
Natural Hickory 1/2" x 4¼"
Natural American Cherry 1/2" x 3¼"
Element American Walnut 1/2" x 3¼"
American Walnut (Juglans) offers rich and varied contrasting tones. Its colour ranges from a beige that’s practically white in the sapwood to a light brown, to chocolate brown in the heartwood. Walnut changes colour moderately over time, becoming a lighter, golden more uniform brown. This wood has a Janka hardness rating of 1010. 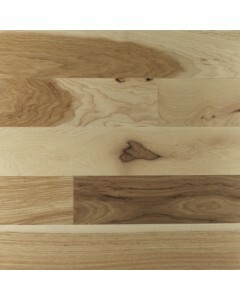 Available Dimensions: 3¼", 4½", 6½ "
Creme Brulee Maple 3/4" x 2¼"
Maple is a fine-grained wood with a uniform texture. Its growth rings are narrow and faintly contrasted. Its colour varies from a beige that’s almost white in the sapwood to a more full-bodied brown, making it the lightest hardwood species. Its colour changes moderately over time, becoming more golden hued. This wood has a Janka hardness rating of 1450. 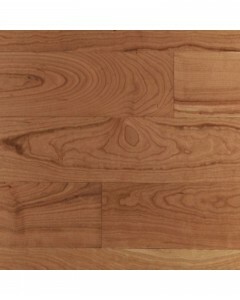 Available Dimensions: 2¼", 3¼", 4¼"
Castello Hickory 1/2" x 4½"
Hickory (Carrya spp.) is a textured wood with visible growth rings. Its colour varies widely in tone, going from golden brown to full-bodied brown. This species also has pronounced knots that accentuate its natural character. It has a Janka hardness rating of 1820. Available Dimensions: 4½", 6½"
Lath Red Oak Mercier Heritage Series : 3¼ " 5" x 1/2"